Location The resort is situated in a quiet, unspoiled location overlooking the breathtaking Mylopotas beach. The island offers the opportunity to visit relaxing places like Manganari beach which is 25 km away and cultural places such as the famous Homer's Tomb located 15 minutes away by car. Links to the public transport network are roughly 50 m from the resort. Facilities The resort is ideal for a relaxing leisure stay. It is luxurious and at the same time simple and charming. An A la carte restaurant, a bar and open-air amphitheatre are provided combined with high quality services such as WLAN Internet access, 24-hour concierge and room service. Comprising a total of 43 guest rooms, the air-conditioned establishment welcomes guests in a lobby with 24-hour reception and check-out service. Guests may store their valuables in the hotel safe and children will be entertained at the playground. Business guests are sure to appreciate the conference facilities. 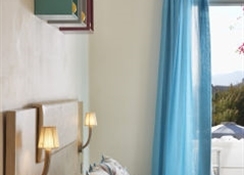 Rooms All the rooms are bright with vibrant colours, designed with style and offer a private terrace or balcony with a view of either the Aegean Sea or the beautiful gardens of the resort. They are fully equipped with an en suite bathroom with shower and bath, a TV, Internet access, a fridge, a safe and individually regulated heating and air conditioning. Rooms with double or king-size beds are available. A hairdryer and direct dial telephone also come as standard. Sports/Entertainment Various facilities such as an outdoor swimming pool, children's pool, gym and a pool bar are available. Sun loungers and parasols are laid out by the pool and on the sandy beach for use. A range of water sports are available for additional fees including waterskiing, jet skiing, diving, surfing, windsurfing, motor boating, banana boating, sailing, catamaran boating, canoeing and pedal boating. Guests may also play tennis or beach volleyball, (the latter incurs a fee). Meals The resort offers a variety of choices for breakfast such as a buffet and continental breakfast. In addition, A la carte and set menu lunch and dinner enrich the dining options. Payment MasterCard and VISA are accepted as methods of payment.